During a Leeds career which spanned a decade, Trevor Cherry experienced the highest of highs and the lowest of lows whilst plying his trade at Elland Road. “I loved football from an early age and although I supported Huddersfield, Dave Mackay was my footballing hero. I started work at the age of 15 as an apprentice electrician, much to the delight of my mother who wasn’t too keen on me focusing solely on football. “London seemed a thousand miles away and I never really contemplated joining Spurs, especially when I heard that Don Revie and Leeds United had come in for me. “I met Don at Leeds Road and couldn’t believe a man of his stature, in charge of such a fantastic club, wanted to sign me. He explained that he wanted me to play left back and eventually replace Norman Hunter in the centre of the defence. 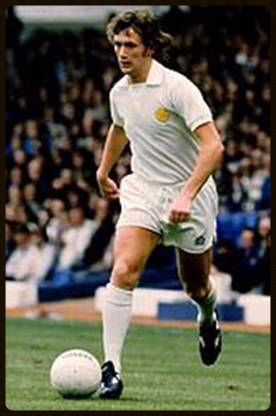 As Leeds challenged for honours at home and abroad, Trevor featured in 39 of the 42 league games and scored his first league goal in a 3-0 home win over Manchester City. That goal was his third in all competitions having scored in victories over Burnley in the League Cup and Carl Zeiss Jena in the European Cup-Winners Cup. With the season starting in disappointing fashion, it also ended that way following a game which Trevor describes as the biggest disappointment of his career when red hot favourites Leeds lost in the FA Cup Final to Sunderland. “I still can’t believe how we didn’t score when Jim Montgomery made that incredible double save from my header and then Peter Lorimer’s effort. It was unbelievable, 99 times out of 100 that passage of play would have resulted in a goal. “Don had told us before a ball had been kicked that he wanted us to go unbeaten. He certainly kept us on our toes and even after winning at Maine Road at the end of October, he told us that if we can’t do it every week, he will bring players in that can. “I had been suspended at the start of the title winning season due to the totting up system. At times it felt like I had a season ticket to London to attend disciplinary hearings at the FA headquarters. The season had started well for Trevor Cherry when he scored Leeds’ goal in a 1-1 draw against Liverpool at Wembley in the season’s curtain-raiser, the Charity Shield. It was a game made famous by the double sending off of Billy Bremner and Kevin Keegan and the Merseyside club eventually ran out winners following a penalty shootout. The season would end in controversial disappointment as Leeds finished on the losing side in the European Cup Final in Paris to Bayern Munich. As one by one, the ageing Leeds United superstars moved on, it became a real period of transition at Elland Road as players like Carl Harris, Tony Currie, Arthur Graham and Paul Hart had been tasked with the responsibilities of bringing back the glory days. “That was a great day, the atmosphere was electric, Elland Road was packed and although it wasn’t the greatest goal ever scored, it counted and in the Quarter Final of the greatest club cup competition in the world, you take it. “Adamson had been a great manager but was past his sell by date when he came to Leeds, the board got that appointment wrong and for the rest of my time there, things didn’t improve and it all ended in disaster when we suffered relegation in 1982 under Allan Clarke. Trevor Cherry pulled on a Leeds United shirt for the last time on the 4th of December 1982 at home to Queens Park Rangers, a game which Leeds lost 1-0. After 485 appearances and 32 goals, it was time for a change. After leaving Elland Road Cherry became player-manager at Bradford City and then worked as a director of a sports promotion firm. “I never thought I would achieve what I did in the game and I was surrounded by some fantastic people. Les Cocker was brilliant with me, he treated me really well whether at Leeds United or with England. “It is sad to see what has happened at Leeds United. I was never a Ken Bates fan and I just hope that Cellino gets it right. The supporters don’t deserve this and I can’t for the life of me understand why people with real money have never invested in the club. Thank you to Trevor Cherry for giving me his time and the opportunity to write this article.